Wheat is as much a part of the outside of my world as it is inside. A quick trip around the inside of my house and you will know that I have a serious case of loving wheat. Not only to bake with, but my home is adorned with wheat bouquets throughout, wheat dishes are stacked neatly in my cupboard, there is a wheat chandelier that I lugged home on a plane from Long Beach, CA that sits amid other various wheat decorations on my walls. And what I find a bit strange is how I relate life (or at least mine) to a wheat plant. So it wasn’t so out of the ordinary when the thought struck me one morning that my life resembles a wheat plant that has emerged as an enhanced and altered version (a GMO) from the old variety to a new breed in order to adapt to a new environment. (basically I culled the old traits that I never liked in myself and adopted ones that I do like and ones that fit better). Looking back the transition just seemed exactly like an "enhanced" wheat plant. And speaking of enhanced wheat plants.... I’ve spent time in wheat labs and know that the researchers will take desirable characteristics and develop them into an existing plant to enhance the overall plant, for instance WSU researchers are working on developing wheat varieties that will grow under severe drought conditions — “desert wheat” and that this research is to focus on identifying genes that will increase wheat yields under drought stress. Pretty amazing stuff. And while I’m still a tom-boy that would rather be playing in the dirt with the tractor than sitting behind my desk, now I’m just a more feminine version. The manicured nails inside the work gloves makes me happy as well as my growing collection of cowboy boots. They are now seen as normal gear for me and when I don’t have boots on; people now comment that I’m missing my signature look. I find that funny. What I have discovered are some traits that have surfaced again, such as my fun loving side and my mischievous nature has firmly entrenched itself in my everyday life, but most importantly is the sheer unabashed delight that I find in living. I again see the “beautiful” in life and I feel like me again. While perhaps my outward appearances has changed a bit (and as my daughters both said, ummm for the better! ), what I find most important is the quality of people that I like to surround myself with. I know who my true friends are, some are made up of family, and the others who are like family to me, these are the ones who have been at my side through everything. And I value the ones that kept me close to their heart, the ones who reached out if not daily, but regularly to let me know they had my back. I’ve also been fortunate to have found love again and he is my version of Mr. Wonderful. His name is Randy. This is the guy who goes along with my crazy ideas and doesn’t complain (really). For example, a couple of weeks ago, I sent him a text later in the evening (on a work night) that there was going to be a meteor shower and to come join me as I was going to set my clock at the 1:00a.m. so I could see it. And yup, he drove the 30 minutes from his house to mine, where he aligned the lawn chairs side by side and we wrapped up in blankets and watched nature put on a show. 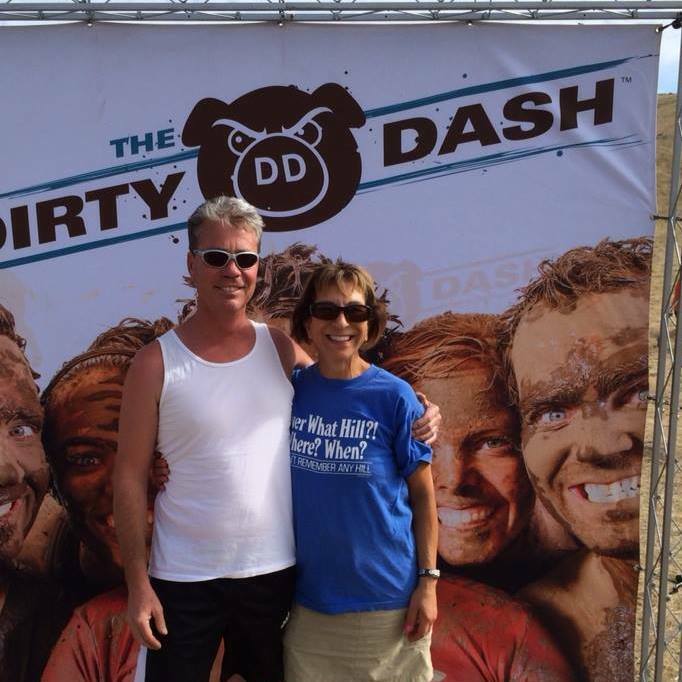 Or earlier in the summer, when he agreed to participate with me and my niece, Sarah, in a mud run/obstacle course. This was the guy who did a magnificent semi belly flop/dive into the first mud hole, lost his sunglasses and but still emerged smiling. Of course after he extended his hand to help me out of the mud bog, guess I wasn’t dirty enough and he pushed me back in….. so yes he has just the right amount of being “sweetly evil” to keep things interesting. He is now hooked on Pintrest and because of that, he now has a “project” to build for me. And he’s excited about it too. I can’t wait to show you when it’s done. He thinks I’m funny, and he loves my quirkiness, and tells me that I’m perfect (I’m not) as he’s seen me show my flash of temper. He appreciates my straightforwardness and my refusal to put up with his crap (his words not mine). He regularly tells me I’m beautiful and that he admires my passion for helping others. He doesn’t complain when I make a mess at his house when cooking and lets me bring my dog over too. He gives me my space and tolerates my aversion to talking on the phone. We’ve been dating now just over a year and we’ve both seen enough from our past failed marriages that we value the good, accept our differences and both vow to being respectful and keeping up communication as priority. I seriously didn’t think a relationship like this could exist or at least for me, but it does. Randy has once again in indulged me in a "project" and here is what I had him tote home for me. is going in my house as a bed. The back of the cab will be the headboard, the tailgate will be the foot-board! Yup a very unique piece,and I must say and I'm an excited little camper! =) Stay tuned as I show you more of the project as it comes together. My posts in a cool magazine!